Many of the older parishioners who gathered in the parish church that day could remember a time when their parish was spiritually dead and the confessionals of the church were home more to cobwebs than to penitents. They likely could recall their parents and others whispering about the peculiar new priest who had recently arrived and how he would be spotted praying in the church at all hours of the day and the night. Now, decades later, their saintly priest lay dying in the rectory, and their once empty church was filled with souls whose lives had been converted through his ministry. At the conclusion of the Mass, the church bell began to toll and a procession made its way to the rectory in order to bring--for the last time--the Eucharist to Fr. John Vianney. As he heard the bell tolling, John Vianney began to weep. His tears were not the tears of sadness or fear. They were the tears of a man who was completely taken up into the Sacred Mysteries. They were the tears of a believer. They were the tears of a saintly priest who had given his entire life to preparing souls to receive the Sacraments and preparing the for heaven. His tears are best interpreted by his very own words. As the priest carrying the Blessed Sacrament arrived at the threshold of John Vianney's room, John Vianney said in his typically pure and penetrating way, "How good the Good God is! When we are no longer able to go to Him, He Himself comes to us." John Marie Vianney was a man who lived the Mystery of the Annunciation. When, through sin, man was no longer able to go to God, God Himself came to us. Through the instrumentality of the Blessed Virgin Mary, God entered into the home of humanity, bringing with Him all that is needed to bring man back to God. Mary was filled with wonder at such a proposition, "How can this be?" John Vianney--the patron saint of priests--spent the entirety of his life living from this exact same wonder. "How good the Good God is! When we are no longer able to go to Him, He Himself comes to us!" Whether it was daily at the altar, offering the Holy Sacrifice or whether it was in his daily imprisonment in the confessional where he would spend most of the day hearing confessions, or whether it was in his teaching catechism, bringing the Sacraments to the dying, or long hours of prayer before the Blessed Sacrament, John Vianney was caught up in wonder at the Mystery of the Incarnation. God had come in search of those whom he loved. 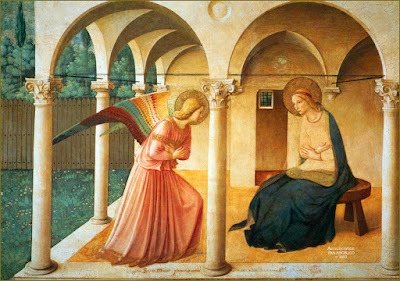 In the Mystery of the Incarnation, the Blessed Virgin was filled both with profound wonder and with profound humility. John Vianney was a true son of Mary. He shared in her wonder and humility. How could God be so good to us? How could this thing happen? Why would he choose me to be his instrument? How is this possible? How could this poor young girl become the Mother of God? How could this simple man command bread and wine to become the Body and Blood of Christ? How could this sinful man absolve the sins of others? Today, on the Solemnity of the Annunciation, I think of those whom the Lord is calling to be his priests. He is calling them to be men who are caught up in the Mystery of the Annunciation. He is calling them to be like the Blessed Virgin Mary who put her whole life--body and soul--at the service of her Son. Through her, God drew close to man. Through the priestly ministry of St. John Vianney, sinners were visited by the mercy and love of God. They received healing, strength, and forgiveness. In every age and in every place, God draws close to man through the Sacraments. All of those who are lost, who are immersed in the darkness of sin, who experience profound alienation from God, all of those who are unable to go to God because of the weight of their sins; to them, God draws close to them through the ministry of the priest. Today, as we rejoice on the Solemnity of the Annunciation, we do so because we recognize our desperate was humanity's plight. We were unable to go to God. But He Himself came to us. For any man considering a vocation to the priesthood, I hope that this calling fills you with profound humility and with wonder. We are servants of the Incarnation. What pure joy it is to think that our whole life could be completely placed at the service of such a great Mystery: "How good the Good God is. When we were no longer able to go to Him, He Himself came to us."